Tom Biesiadny, Director of the Fairfax County Department of Transportation attended the monthly FABB meeting last night. 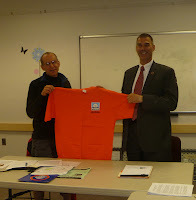 He gave us an overview of the Bicycle Program and shared is vision for the program in the future. Tom is a bicyclist who lives and rides in the county on a regular basis. For several years he has ridden in one of the more difficult and popular multi-day rides in the country, RAGBRAI. As a cyclist he is intimately familiar with the problems we face on a daily basis. The Board of Supervisors is researching various options for local funding of transportation projects and bicycle projects are an integral part of that discussion. Bicycling will play a bigger role in the transportation system in the future because it's a cost-effective solution to relieving congestion. FFX DOT recently got approval to fill the Bike Program position vacated by Jeff Hermann nearly a year ago. While the new person will be asked to handle additional duties, working on bicycle projects will be a key part of the position. The County will look into implementing encouragement activities similar to those conducted by BikeArlington. While our CMAQ funds are allocated for the next couple of years, other sources could be used and that will be discussed more in the future. Trail Maintenance: There are funds in this year's budget to assess the condition of the 700 miles of trails in the county and to develop a prioritized list of needed maintenance. While we would like to have funds to actually conduct maintenance this year, this is a start to addressing a long term problem. There has been no money for trail and bike facility maintenance for many years. After his talk we presented Tom with a FABB t-shirt. We look forward to working with him in the future.